Keywords: Tar and asphalt burn injury; tissue management; removal agents; butter. Hot tar and asphalt boil at high temperatures and can cause serious burn injuries if they come into contact with the skin. Most accidents involving hot tar affect young workmen; accidents can be prevented through the adoption of safe working practices. The prompt removal of tar from a burn is essential in order to allow early assessment and to prevent infection. Butter has been shown to be an effective, safe and cheap method of removing moderate amounts of tar from a burn injury. Accidents in the workplace are the most common cause of hot tar burns. The sticky nature of hot tar and asphalt means that its removal from burn injuries can be problematic. Numerous agents have been used in the past to remove tar, but many of these are ineffective, hard to come by and even potentially harmful. This case report describes the efficient removal of tar using commercially available butter. Hot tar and asphalt have many industrial applications such as road surfacing, roofing and waterproofing. Tar is a petroleum-distillate, composed of long-chain hydrocarbons, which waxes at high temperatures. Boiling points of paving bitumen (asphalt) and roofing tar are 140�C and 232�C respectively. When tar splatters it rapidly cools to between 93�C and 104�C. This temperature is sufficient to inflict serious burns ,. Most tar burns occur on building sites and are usually the result of slipping while carrying a bucket of hot tar, or falling into freshly laid tar ,. Most accidents, unsurprisingly, involve active, young males (mean age 27-33 years). The majority of burns are to the upper extremities and hands ,, with the mean burn size affecting 4-13 percent of the total body surface area ,,. Roofing accidents tend to cause deeper burns due to the higher temperature of the tar used. Initial treatment involves early cooling with water to limit tissue damage and prevent further spread of the tar ,. However, cooling is advised only until the tar has hardened to prevent hypothermia . The tar then needs to be removed to allow assessment of the wound and reduce the risk of infection, as skin bacteria can proliferate freely under an occlusive barrier of tar . Removing the tar is often difficult because of its sticky consistency, which causes it to adhere tightly to the skin. Manual debridement has been used in the past, but this is painful and damages viable skin, inflicting further tissue injury and increasing the risk of infection ,,. Chemical debridement using recognised organic solvents such as kerosene, gasoline, acetone and alcohol are of limited use and have the potential to cause skin irritation and even systemic toxicity through absorption , . Agents that have been found to be helpful in removing tar include a citrus and petroleum distillate ('De-Solv-It'), a petrolatum distillate with surfactant and lanolin ,, mayonnaise , neomycin-ointment , sunflower oil , and baby-oil . Another effective, inexpensive and non-toxic method, which can be considered is the use of butter . This is described in the following case report. 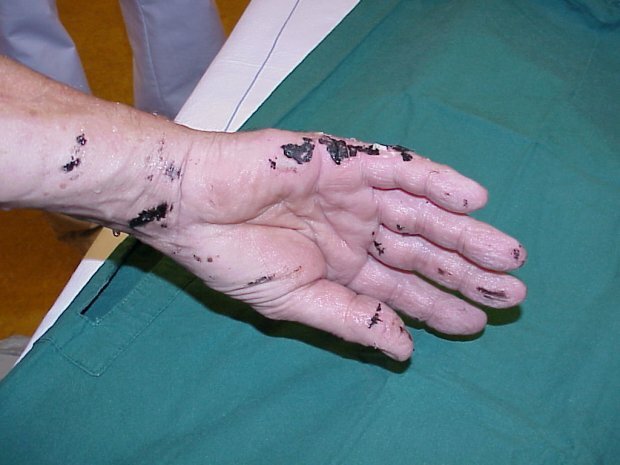 A 35-year-old man presented to the emergency department with a hot tar burn to the right hand, having accidentally spilled tar while working as a roofer. Immediately following the injury, he had put his hand in a bucket of water. 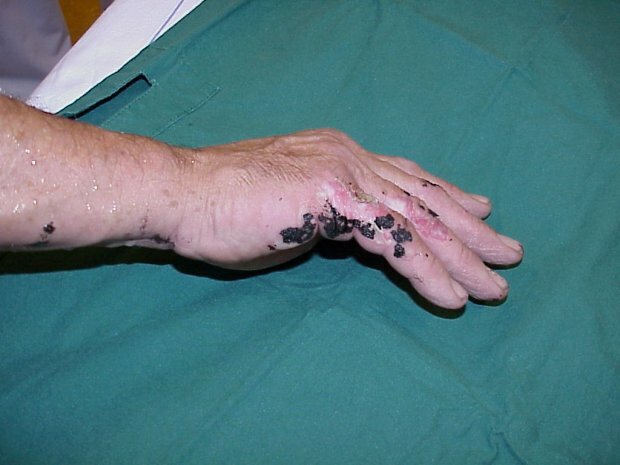 Initial assessment indicated that he had sustained a second degree burn to the right hand presenting as open blisters partially covered in tar. Initial treatment involved rinsing with cool water for 15 minutes. Although this helped to cool the injury it made no impact on the tar itself (Figure 1 and Figure 2). In the absence of other products for the removal of tar, commercially available butter (Figure 3) was applied (Figure 4). Figures 1 and 2 show the tar still intact after 5 minutes' rinsing with cool water. Figure 3 - Commercially available butter is used. 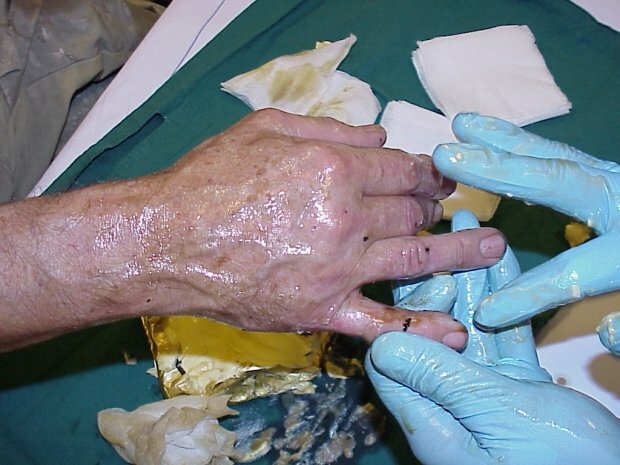 Figure 4 - The butter is applied using non-sterile gloves. The application of the butter was relatively simple and the effect clearly visible (Figure 5 and Figure 6), with the tar fully dissolved after 15 minutes. At this stage the butter/tar residue was easily removed by absorption using a dry dressing (Figure 7, Figure 8 and Figure 9). The patient did not complain of having pain during the procedure and no analgesic agents were required. Figure 5 - The gradual disappearence of the tar is clearly visible while applying the butter. Figure 6 - This simple and pain-free procedure resulted in removal of all the tar in 15 minutes. Figure 7 - Figures 7-9 The tar/butter residue was removed using a dry dressing. Once the tar had been removed, silver sulfadiazine (Flamazine) was applied and the wound covered with a non-absorbent dressing. This was repeated daily for the first three days in the outpatient department. Further debridement of the wound was not required and there no signs of infection (Figure 10). In line with usual protocol, the patient dressed the wound at home with regular follow-up once a week in the outpatient department. Treatment with silver sulfadiazine was stopped after 14 days. The burn healed well and the patient regained normal function of his hand. 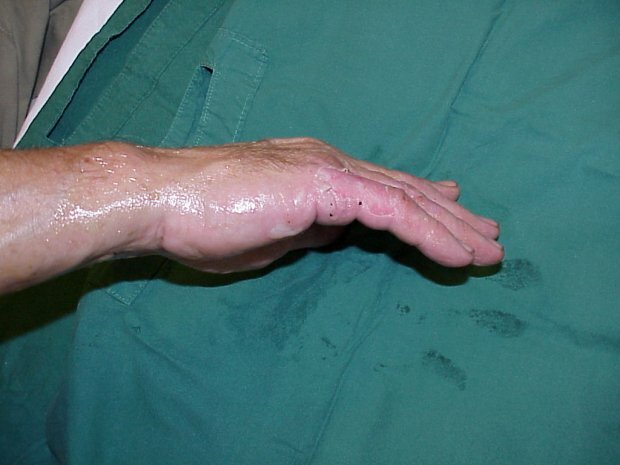 Figure 10 - The patient's hand after three days' treatment with silver sulfadiazine. Many methods have been described for the removal of tar. It is known that solvents used to remove tar should have a structure closely resembling the solute. Petroleum-based ointments such as petrolatum (an oleaginous colloidal suspension of solid microcrystalline waxes in petroleum oil) therefore will dissolve tar. As a petroleum-distillate , Neosporin ointment (polymyxin B, zinc bacitracin and neomycin sulfate in petrolatum base) can also dissolve tar within 12 hours . The citrus and petroleum distillate, 'De-Solve-It', is a non-toxic household agent, which has also been shown to easily remove tar. Baby oil contains liquid paraffin, a hydrophobic molecule that dissolves tar; the resulting mix is water-soluble and is easy to wash off after one hour . Sunflower oil and butter emulsify the tar in 30 and 15-30 minutes respectively, after which the residue is readily absorbed into a dry dressing , . In the presence of large amounts of tar, repeated applications may be needed. 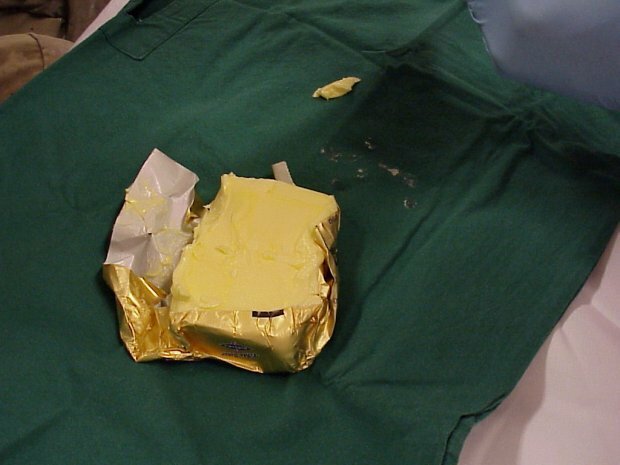 In the case report described above, butter was used in the absence of any alternative agents. This resulted in the effective and painless removal of all the tar. Self care of certain wounds as described in the case report is relatively common in Holland once the patient or caregiver has been taught how to apply the dressing. If they do not want to change the dressing, however, or if they do not appear to be coping at follow-up, the patient's ongoing care is managed in the outpatient department. 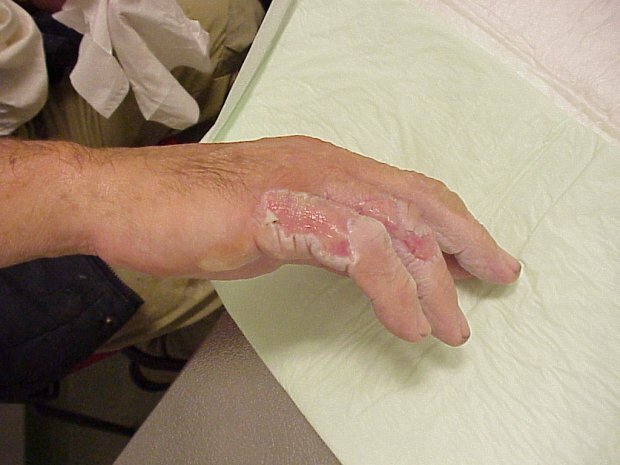 Tar and asphalt burns are a challenging clinical problem. Manual removal of tar is painful and may lead to further tissue damage by removing viable skin and marginal tissue, extending the depth of the wound . Removal is essential, however, to allow early assessment of the underlying tissue damage and reduce the risk of infection . Numerous agents have been described to remove tar, but many of these are relatively ineffective, hard to come by and even potentially harmful. The case reported demonstrates the effectiveness of butter in removing moderate amounts of tar. Butter is readily available, quick and inexpensive. Tar burns are preventable accidents. Development of safe working practices including the use of protective clothing could greatly reduce the incidence and severity of burns. 1. Stratta RJ, Saffle JR, Kravitz M, Warden GD. Management of tar and asphalt injuries. Am J Surg 1983; 146: 766-69. 2. Ashbell TS, Crawford HH, Adamson JE, Horton CE. Tar and grease removal from injured parts. Plast Reconstr Surg 1967; 40: 330-31. 3. Renz BM, Sherman R. Hot tar burns: twenty-seven hospitalized cases. J Burn Care Rehabil 1994; 15: 341-45. 4. Baruchin AM, Sachraf S, Rosenberg L, Sagi AA. Hot bitumen burns: 92 hospitalized patients. Burns 2004; 5(23): 438-41. 5. Turegun M, Ozturk S, Selmanpakoglu N. Sunflower oil in the treatment of hot tar burns. Burns 1997; 23: 442-45. 6. Alexander G, Rajacic N, Ebrahim MK, Ghoneim I. MEBO and hot bitumen burns. Burns 2003; (29): 863-65. 7. Frye KE, Izenberg SD, Williams MD, Luterman A. Simulated biologic intelligence used to predict length of stay and survival of burns. J Burn Care Rehabil 1996; 17: 540-46. 8. Shea PC Jr, Fannon P. Mayonnaise and hot tar burns. J Med Assoc Ga 1981; 70: 659-60. 9. Juma A. Bitumen burns and the use of baby oil. Burns 1994; 20: 363-64. 10. Tierman E, Harris A. Butter in the initial treatment of hot tar burns. Burns 1993; 19: 437-38. 11. Schiller WR. Tar burns in the southwest. Surg Gynecol Obstet 1983; 157: 38-39.